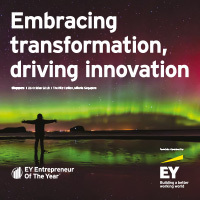 The EY Entrepreneur Of The Year is an annual awards program that honors Singapore’s top entrepreneurs for their contributions to the economy and society. For more than a decade, EY has been committed to supporting the entrepreneurial cause in Singapore, coinciding with the government's focus on fostering entrepreneurship and grooming local entrepreneurs to take on the world market. Have a question about our program? We’d love to hear from you.